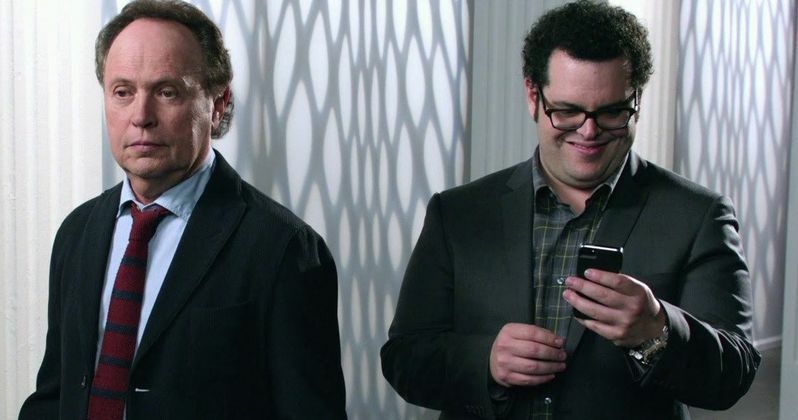 FX has released a new trailer for their upcoming comedy series The Comedians, which reveals that series stars Billy Crystal and Josh Gad are essentially playing fictionalized versions of themselves. When the show was first announced back in March, it wasn't explicitly stated that both actors would be taking on various aspects of their personal lives, but that point is made clear in this trailer, when Josh Gad answers his cell phone with the greeting "Go for Gad." The footage also describes the show as "An FX Original Comedy about an FX Original Comedy." In The Comedians, Billy Crystal plays a comedy legend who is reluctantly paired with Josh Gad, an edgier up-and-coming star, in an unfiltered, behind-the-scenes look at a fictional late night sketch comedy show where egos and generations collide. Stephnie Weir stars as "Kristen Laybourne," the anxiety-ridden producer behind The Billy & Josh Show who frequently finds herself caught in the middle of Billy and Josh's arguments, Matt Oberg stars as "Mitch Reed," the show's head writer, and Megan Ferguson stars "Esme McCauley," a no-nonsense production assistant. Larry Charles (Curb Your Enthusiasm, Seinfeld), Matt Nix (Burn Notice), and Ben Wexler (Community, Arrested Development) are Writers and Executive Producers of The Comedians, along with Crystal. Charles directed the pilot, with Josh Gad serving as Co-Executive Producer. The half-hour, single-camera comedy is produced by Fox 21 Television Studios and FX Productions. Take a look at the new footage below before The Comedians premieres April 9 on FX.